The new custom Water Pipe Adapter for the Magic Flight Launch Box Vaporizer replaces your standard water pipe slider. Just like that, you can now use your Magic Flight Launch Box with your favorite water pipe. Enjoy the water filtered vapors with your favorite Box! NOTE: The WPA fits only those water pipes that have a glass-on-glass standard 14mm taper AND which are mounted at an angle. We also offer a 19mm Glass Adapter that will work with the larger bowl fitting. This glass adapter works in conjunction with the Water Pipe Adapter. Currently, these are the only two sizes available, and it does not support vertically mounted downstems. Water Pipe pictured not included. Please double check that the adapter is compatible with your water pipe before purchase. Fits all genuine Magic Flight Launch Box Vaporizers. 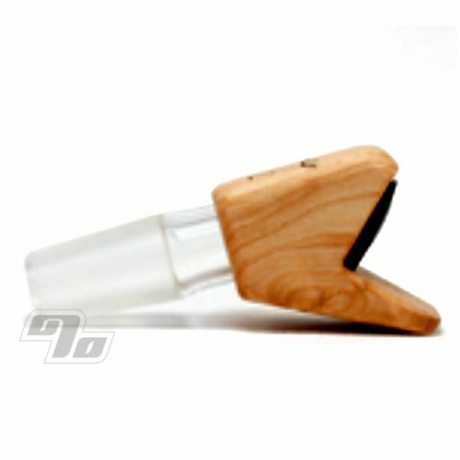 This is a nice addition the the launch box, and if you are an everyday vape baker then you would love this piece, simply add the launch box to it and draw your smoke through your favorite water pipe ! This little adapter works exactly as you'd expect. It allows you to really pull a lot of vapor out of your little launch box. There really isn't a whole lot else to say. I gave it 4 stars instead of 5 because I think the design could be improved a bit. Lining up the seal isn't hard but kind of inconvenient. 1percent is great and this is the only place I could find this little guy.